Every New Year's Day I would make some type of celebratory pie. It would bring us luck and fortune in the coming year. Yes. Apparently a pie is responsible for all those things. And it's delicious to eat. One cannot lose, no?! Well the tradition was set to start with my first homemade pâte brisée pie crust (Stirling Creamery was kind enough to let me sample some of their Churn 84 Butter for the recipe - it is delicious and is higher in fat content than other butters you can buy in Ontario so it helps pastries and pies and other treats be much flakier than if you use normal butter). This was an ambitious first attempt to say the least. Forget to chill the blade! Damn it! My butter was freezing cold but I. Forgot. To. Chill. The. Food. Processor. Blade. Add too much ice water! Even if the f*#*(*g dough won't stick together, DON'T ADD TOO MUCH BLOODY ICE WATER. Don't! Overknead it! It makes your pie crust extremely tough. I had a crumbly texture like the recipe picture showed, but when it came time to form it just a bit, enough to get it into ball form for chilling, I couldn't get the dough to stick together. And if I couldn't get it into a decent ball, I knew it wouldn't roll out. So I had to sort of knead a bit to get it into a ball form... you're not really supposed to knead it at all but what's a girl to do?! LOL I couldn't even get enough to roll out properly to make a good size crust, let alone a double crust as I had planned. It was edible, and eat it we did, but it was pretty tough. Pâte brisée, I will conquer you eventually! 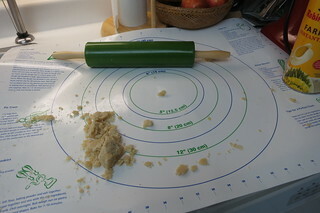 But I think for Jan. 1, 2014 I will master my mother's pie crust for sweet pies. :) Can't wait! So what were you up to New Year's Day? Did you have any kitchen wins or fails? Tell me about 'em in the comments!